Tomato is considered one of the most profitable crops grown in high tunnels, but continually growing one single crop leads to build-up of diseases. In addition, growers are facing more competition in selling tomatoes in the market. To enhance resilience of high tunnel system and increase access to consumers, crop diversification is important. In this article, instead of discussing tomatoes, we will focus on another high-value crop, seedless cucumber. Fresh consumed seedless cucumber is a popular crop in local food markets. It sells at a premium price in early seasons as does tomato. Seedless cucumbers grown under protected cultures are parthenocarpic, which do not require pollination. 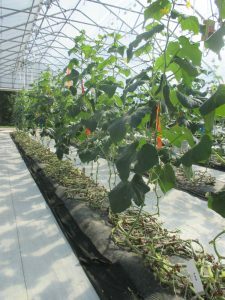 In addition, the climbing habit allows trellising, which maximizes the use of vertical spaces, making seedless cucumber an ideal crop for high tunnel production. Parthenocarpic cucumbers are available in different types. The long ones are often referred to as European, Japanese or English cucumbers. They have thin skins with longitudinal ridges. They are often individually wrapped to prevent postharvest fresh weight loss. Beit Alpha cucumbers are smaller, with a wide range of sizes. Large Beit Alpha cucumber is similar to slicing cucumbers. Pickling cucumbers with the parthenocarpic character are also available in the market. 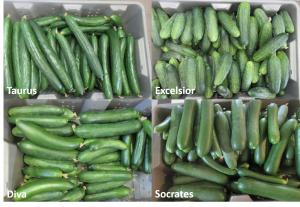 In spring 2016, we evaluated the yields of four seedless cucumber varieties grown in soil in a high tunnel at the Southwest Purdue Agricultural Center. 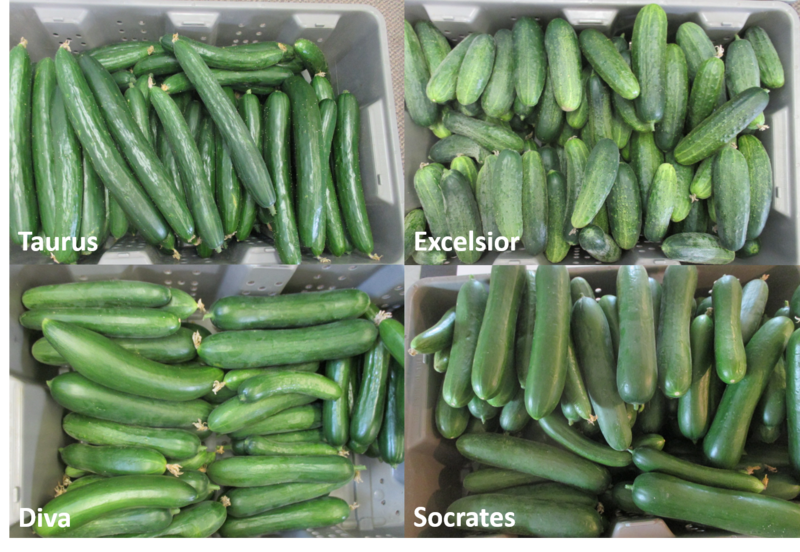 The varieties are Diva (slicing type), Socrates (large Beit Alpha type), Excelsior (pickling type) and Taurus (Japanese type). Seedlings were transplanted on March 30. They were planted 12 inches apart on plastic covered beds. We encountered a cold period in early April with average soil temperatures less than 60°F. Cucumbers are extremely susceptible to the low soil temperatures, as more than half of the newly planted seedlings were killed. The dead plants were replanted on April 14. We started to harvest ‘Excelsior’ on May 9, ‘Socrates’ on May 13, ‘Taurus’ on May 16 and ‘Diva’ on May 27. Harvest was conducted three times a week, and lasted till August 8. Table 1 and 2 showed the yield of the four varieties in May, June, July, August and the entire season. ‘Socrates’ had the highest yield, and produced the most fruit. ‘Taurus’ had the lowest yield but still produced more than 25 cucumbers per plant. Talking with several people who tasted the cucumbers, most of them think ‘Taurus’ had the best taste. Table 1. The yield of parthenocarpic cucumbers in May, June, July, and August in the season of 2016. Table 2. The total yield of cucumbers in the season of 2016. In the trial, all the cucumbers were trellised and pruned, leaving 1-2 fruit per node. Trellising needs to be conducted twice a week, particularly in June, when vines grow more than 20 inches a week. Growth rate of ‘Taurus’ was slower compared to other varieties in June and July (Table 2). Seedless cucumber lose fresh weight quickly after harvest. Without cooling, fresh cucumbers lost 9 to 13 grams of fresh weight in the first 24 hours under ambient room temperature and humidity. After 5 days, 23.89 to 49.6 grams of fresh weight were lost. Among the varieties, ‘Taurus’ is the most susceptible variety to fresh weight loss while ‘Excelsior’ was the least susceptible variety. Throughout the season, we continuously pruned older leaves of each plant. This practice did a good job in controlling, or at least slowing down spread of powdery mildew and two-spotted spider mites. However, we did notice ‘Excelsior’ is more susceptible to two-spotted spider mites compared with other varieties. Cucumber beetles were observed in early June, but wilt did not occur until the end of July. We started to see more plants wilt in early August, which made us decide to terminate the trial on August 8. Figure 2. Older leaves were pruned on cucumber plants. This trial showed the great promise of growing cumbers in high tunnel system to achieve high yield and extend the harvest season. Early planted cucumbers take a higher risk of transplant failure under low soil temperatures. However, another of our study demonstrate that this challenge can be overcome by using grafting technology. Seedless cucumbers need to be well packaged to prevent fresh weight loss, this is particularly true for the long-type cucumbers. Growing cucumbers in the early season and using appropriate cultural practices may provide a solution for organic growers to combat pest problems. For more information about the cucumber study please contact Wenjing Guan at guan40@purdue.edu or (812) 886-0198.